The Acer XDS driver is designed for the vast majority of golfers to experience a distance-enhancing draw off the tee. Features internal heel-weighting which shifts the center of gravity closer to the hosel, assists squaring the face up at impact and enhancing gear effect to impart draw spin. Sporty and awe-inspiring and at the same time is a way to perfectly describe the Obsession ladies golf club driver. Drive in style as the generous, confidence-building size is amply lofted to get up in the air easily and as equally as long as any other ladies tee club on the market. No more slices with the XV Draw Titanium Driver. 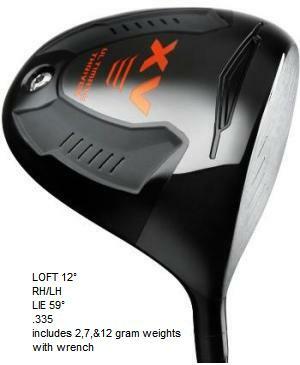 A versatile and technologically enhanced driver available in a variety of lofts to suit players of all skill levels. The classic appearance has a lot of functionality from the addition of the Power Chamber sole, Gravity Port and CNC milled crown. The XV Titanium Driver is a versatile and technologically enhanced driver available in a variety of lofts to suit players of all skill levels. The classic appearance has a lot of functionality from the addition of the Power Chamber sole, Gravity Port and CNC milled crown. The XV Thriver Mini is a special shallow faced control club off a short tee as well as a club to use in the fairway when you need the maximum distance to reach a par 5 or long par 4. The Acer XV Ultimate Thriver provides golfers with the best of both worlds by generating driver distance with the control of a fairway wood off of the tee. Year after year, one of our Thrivers has been one, if not, our highest selling and rated tee club. The XV is the 4th generation model and improves upon several features that have made these fairway-finding demons. Square design for long straight drives.